MANDALAY – New committee members for the Mandalay City Development Committee (MCDC) were sworn in on Friday, six months after MCDC’s election. 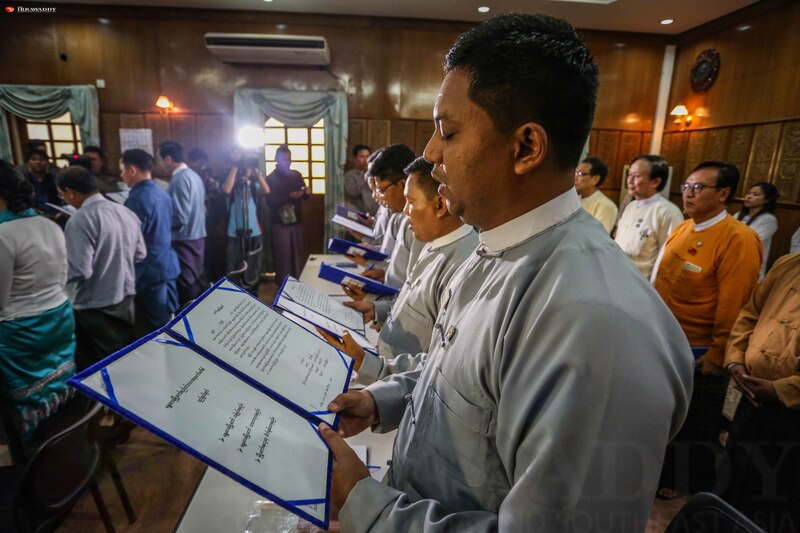 At the ceremony, six members elected by the public in 2016 and five others selected directly by Mandalay’s regional government were sworn in as the new committee representatives. “The first thing I would like to do is to amend the municipal law, which needs to be modified in some parts,” said U Kyaw Zaw Aung, an elected MCDC member and a jade trader. He said that the law calling for for the appointment of the mayor directly by the regional government needs to be amended to allow for a public election of the mayor. At the ceremony on Friday, committee members vowed to work for the city and the people. Chief Minister of Mandalay Division U Zaw Myint Maung urged the new members to revive the image of MCDC, in which he pointed out that the locals have lost interest and faith. “In past years, the image of MCDC has not been in good shape because of mismanagement by the ex-government. New committee members have to revive it,” said the chief minister. “The public interest and hopes are also high and there are many eyes looking on at MCDC’s new committee members. I would like to urge you all to work sincerely and to always look toward the public’s needs,” he added. Although the committee members were sworn in,their duties, official ranks and the position of vice mayor have yet to be appointed. “We will try our best with any kind of duties appointed to us. As for me, I’m hoping to reform the weak points of the MCDC,” said U Kyaw Yin Myint, an author and columnist from Mandalay who was selected to serve on the committee directly by the regional government. The public election for the MCDC was held in September 2016. Six members—U Ye Mon, U Saw Han, U Zaw Myo Lwin, U Kyaw Zeya, U Kyaw Zaw Aung and U Khaing Myint, from Amarapura, Pyigyitagon, Chanmyathazi, Chanayethazan, Maha Aung Myay and Aung Myaythazan townships, respectively—were elected out of 34 candidates. Members handpicked by the regional government include U Kyaw Yin Myint, Dr. Thit Sin, U Ye Myat Thu and DawMyint Myint Than. Secretary U Aung Kyaw Tun, and joint secretary U Thet Naing Tun were re-appointed.